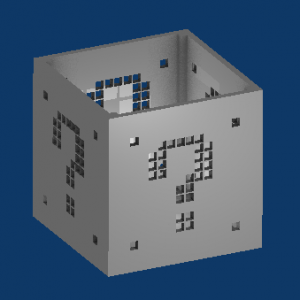 It’s the question-mark box from Super Mario Brothers! Put your coins in it! Hide a mushroom or fireball (the candy of that name, obviously) in it! The other day, I thought I’d design a 3D-printed box. 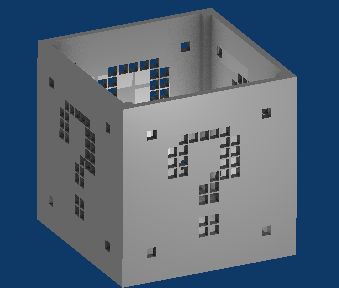 This wouldn’t be just any old box, but the question-mark block from Super Mario Brothers. I started to break down what would be involved in the design. I would have to come up with the base box template, then virtually punch out a grid of dots representing the correct pixels. But, I thought, if I was going to do the work to calculate a grid of pixels on the box faces, I really could just put any pattern on the side. And if I could put any pattern, I might as well turn it into a template. And if it was a template, then other people could come up with some pretty cool designs that I never even thought of. So I made it a web-based template. You can now make your own Super Mario Question Mark (or any pixel art) box. 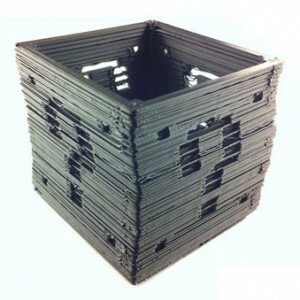 Or if you’d rather just grab the pre-made question-mark box, grab it from Thingiverse. You'll have to pardon the layer alignment on the print in this picture. I just got an updated print head and am still fine-tuning the parameters.